My online group coaching is an accelerated method of high-impact, results-driven coaching. Group coaching is more affordable than one-to-one coaching. You can participate from anywhere in the world, you’re part of a community of like-minded people, and the comprehensive program is proven to cause unprecedented results. 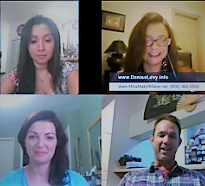 Is online group coaching right for you? Do you feel frustrated knowing that there is so much more you could be doing with your life? Have you ever found yourself watching on as others with less talent and ability to succeed and seem to get all the lucky breaks while you don’t? Unlock the hidden reasons you’ve been held back. Liberate yourself from the constraints the past has imposed upon you in the present. Free yourself from any pain or regret over your past. Eliminate any resentment, upset, anger or sadness you have with other people. Uncover the secrets to unleashing your power. Love yourself completely, and be filled with authentic self-confidence. Know yourself as someone who is true to yourself and your values. Group coaching is currently full. Please submit your information to be placed on the waiting list and you will be contacted as soon as I have an available opening.